Copyright Notice: © 1999 Julia Donaldson & Axel Scheffler. 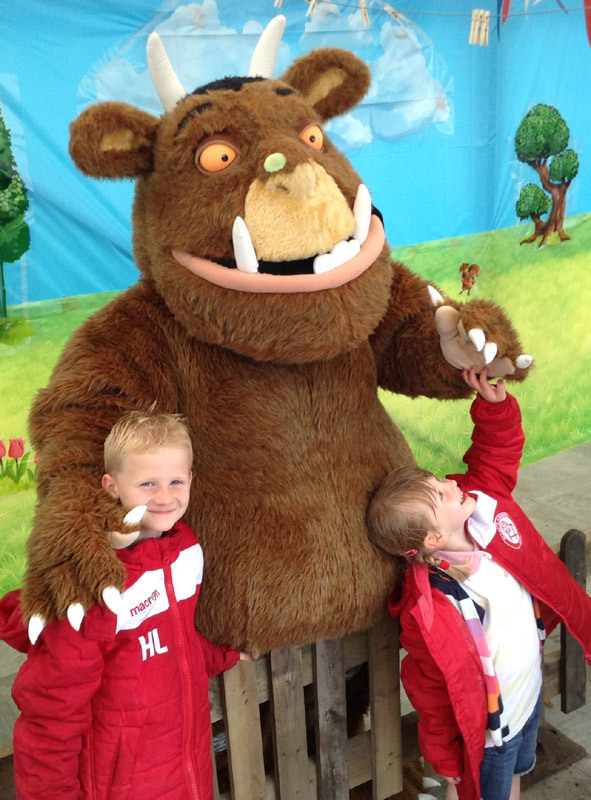 These are the official The Gruffalo licensed characters, The Gruffalo. 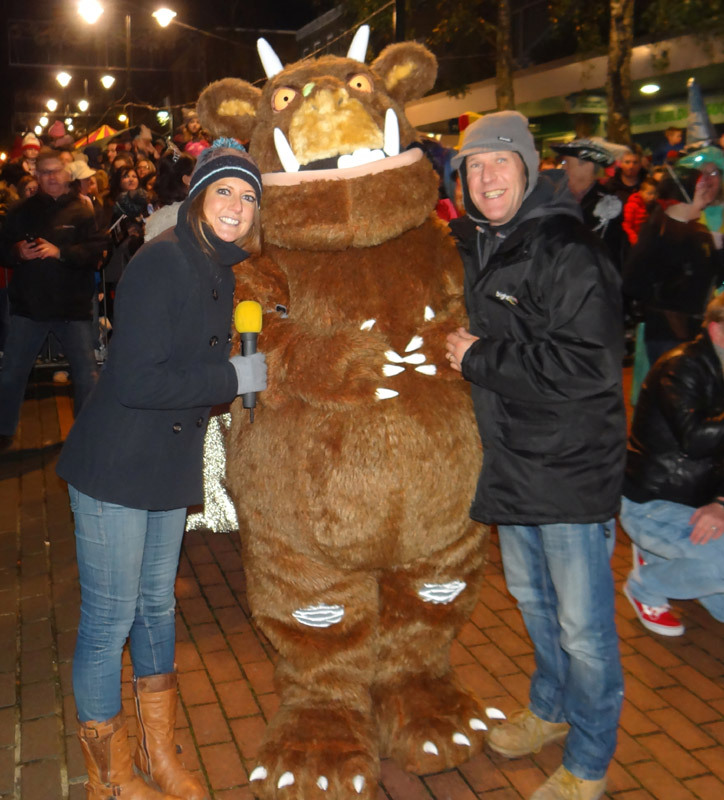 Rainbow Productions holds the UK’s official licence to manage the personal appearances of The Gruffalo at public events on behalf of the brand owner. We take care of everything; our full service includes the copyrighted character costume, trained performer and Road Manager (minder) to accompany the character. Please visit our character events page to find out more. Due to the nature of the events we manage, we are not able to supply characters for private children’s parties or similar events. The Gruffalo tells the story of a mouse who meets a predatory Fox, Owl and Snake on his journey through the dark woods. In order to avoid becoming their tea, he describes a mythical monster named The Gruffalo to scare them away. As the mouse continues his journey into the woods, he soon discovers that the creature he’s invented does actually exist and finds himself having to convince The Gruffalo that he is the scariest animal in the woods. 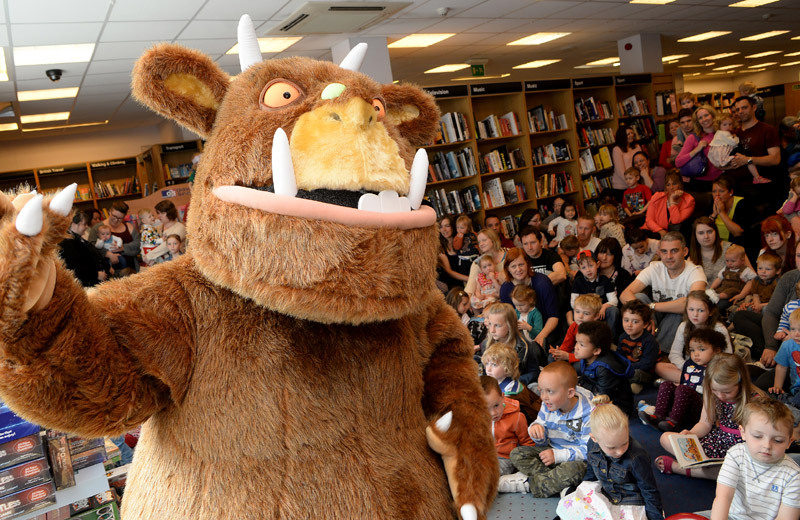 Created by Julia Donaldson and Axel Scheffler, The Gruffalo is a multi-award-winning title and was also voted the UK’s favourite bedtime story in 2009. Winner of Best Marketing and Communications Award at The Licensing Awards 2015. Since its publication in 1999, the story has been developed into a film which has been broadcast in 180 countries, received Oscar & BAFTA nominations and features the voices of Helena Bonham Carter, Rob Brydon, Robbie Coltrane, James Corden, John Hurt and Tom Wilkinson. 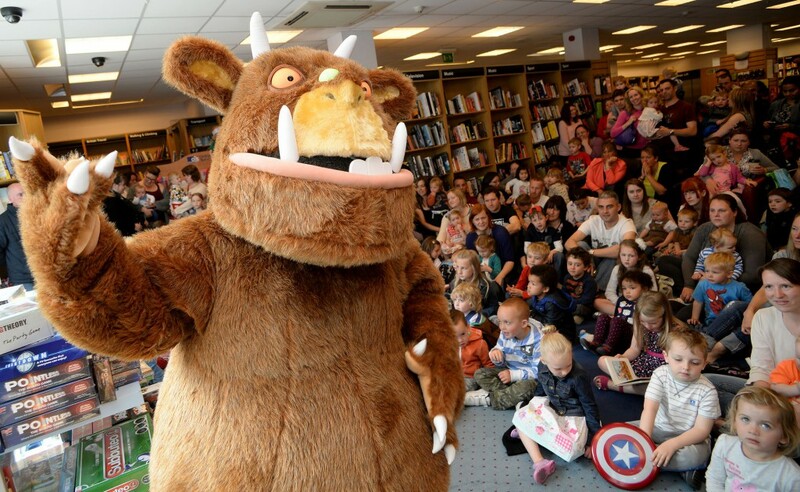 The Gruffalo is available to attend UK events. Rainbow Productions has 30 years of specialist experience in delivering authentic character appearances within a range of environments. All of our costume characters available for personal appearances are managed under licence and are 100% official. With a trained performer and dedicated road manager, we aim to make your event an experience your guests will love!